Our Abpromise guarantee covers the use of ab140950 in the following tested applications. (In a final volume of 100 µl). Immunohistochemistry (Frozen sections) - Anti-PD1 antibody [J116] (ab140950)This image is courtesy of an anonymous Abreview. 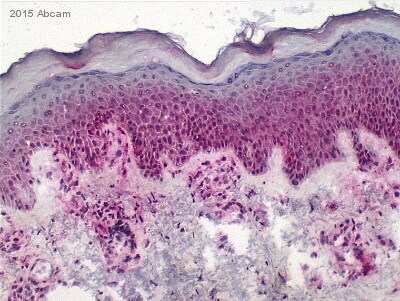 ab140950 staining PD1 in human atopic dermatitis tissue sections by Immunohistochemistry (IHC-Fr - frozen sections). Tissue was fixed with methanol and blocked with 4% serum for 30 minutes at 25°C. Samples were incubated with primary antibody (20μg/ml) for 16 hours at 4°C. A Biotin-conjugated anti-mouse IgG polyclonal (10μg/ml) was used as the secondary antibody. Immunohistochemical analysis of formalin-fixed, paraffin-embedded Human tonsil tissue labelling PD1 with ab140950 at 20 µg/ml. Flow Cytometry - Anti-PD1 antibody [J116] (ab140950)This image is courtesy of an anonymous abreview. Flow Cytometry analysis of peripheral blood cells, separated by Ficoll density separation labeling PD1 with ab140950 at 1µg/ml. PBS with human IgG (Fc-block) was used as the sample buffer. 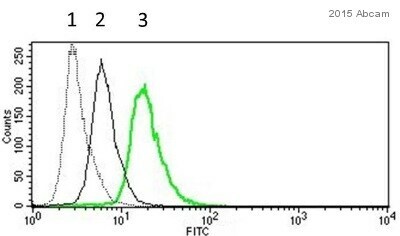 A goat anti-mouse FITC conjugated secondary antibody was used at 1/100 dilution. Isotype control (1), Untreated control (2), PHA treated (5ng/ml) (3). Immunohistochemistry (Formalin/PFA-fixed paraffin-embedded sections) - Anti-PD1 antibody [J116] (ab140950)This image is courtesy of an anonymous Abreview. ab140950 staining PD1 in human nasopharynx tissue sections by Immunohistochemistry (Formalin/PFA-fixed frozen paraffin-embedded sections). Tissue samples were fixed with paraformaldehyde and blocked with 4% serum for 30 minutes at 25°C and antigen retrieval was by heat mediation in citrate buffer (pH 6.0). The sample was incubated with primary antibody (20ug/ml) in blocking buffer at 4°C for 16 hours. 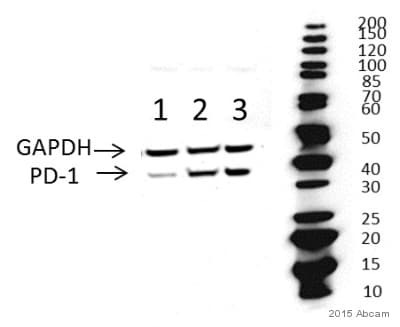 An Alexa Fluor® 488-conjugated Goat anti-mouse polyclonal (1/100) was used as the secondary antibody. ab140950 has not yet been referenced specifically in any publications. Publishing research using ab140950? Please let us know so that we can cite the reference in this datasheet.